People choose to "bank" with us, but we're more than just a bank. We strive to be an integral part of the community. After all, we live here too. From providing banking services and employment opportunities, to finding ways to give back, Sunflower Bank works hard to make a difference. As an organization, we align a portion of our giving with our community reinvestment goals. This includes helping non-profits that focus on affordable housing, community redevelopment, financial education, and improving the lives of those less fortunate. We know we can make a difference and we challenge our staff to do the same. We strive to create possibility in our communities. Sunflower Bank understands that change can’t be done through donations alone, it takes do-ers. Therefore, Sunflower Bank gives each employee 24 hours a year to go out into the community and make an impact by volunteering. Employees are encouraged to find organizations they are passionate about and Sunflower finds ways to support those passions. Through donations, sponsorships, corporate partnerships, and providing volunteer time, we have become part of the fabric of our local communities. 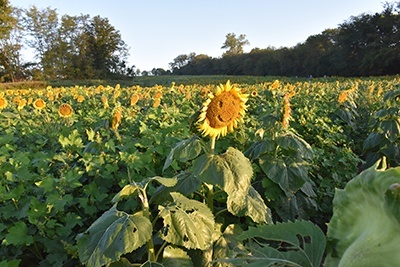 Sunflower Bank is defining what it means to be a community bank.